The biggest surprise of Brooklyn is how determinedly sweet it remains to the end, its period vibrancy bordering on the genteel. In navigating the push-pull narrative of Eilis (Saoirse Ronan), a young Irish girl who relocates to New York in the early ’50s, director John Crowley leaves little doubt as to what’s in his heroine’s best interests, juxtaposing the dreary, oppressive milieu of her homeland with the nouveau pastels of New York City. It’s here, in her newly-adopted home, that Eilis ameliorates from despondent naïf to a woman possessed of agency for the first time in her life. Screenwriter Nick Hornby’s last adaptation – Cheryl’s Strayed’s Wild, a memoir similarly concerned with one’s spiritual journey to autonomy – suffered from a rushed narrative that compromised our ability to burrow into the headspace of its heroine. Here, Hornby’s adaptation of Colm Toibin’s novel of the same name displays a confident patience in developing Eilis through quotidian details: her career aspirations (accounting courses sponsored by the local Irish priest), her blossoming social confidence, and an irresistible romance with an enamored Italian boy, Tony (Emory Cohen), all smile lines and charm, and unequivocally devoted to Eilis. The effortless classicism of the story is equally breezy and affecting, never succumbing to the need for heightened drama that plagues so many similar films, and all the more touching for it. 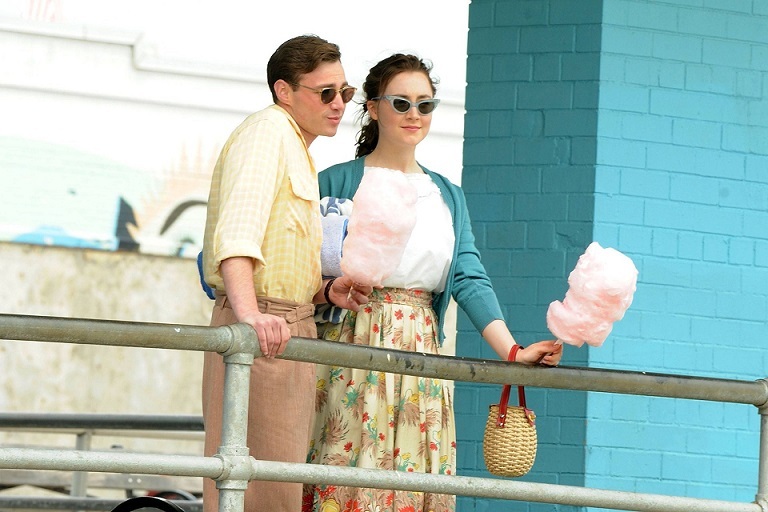 Brooklyn transcends the banality of a happy ending for something murkier and more beautiful. But Brooklyn‘s final third threatens to undermine that easy allure. After tragedy strikes, Eilis returns to her native Ireland with the intention of a temporary stay, but the community seems almost conspiratorial in its efforts to keep her home, fostering familial guilt, employment opportunities, and most convincingly, an introduction to local boy Jim Farrell (Domnhall Gleeson). Jim is by all accounts a catch, but he also comes across as acutely drab. But what could appear to be a weakness upon a cursory appraisal – the apparent lack of competition between Tony and Jim – turns into a compelling exhibition of Eilis’ state of mind. For much of his time on screen, Jim is imbued with a certain inherent villainy, due exclusively to his direct relation to the virtuous Tony, and the film’s biggest problems lie in Crowley’s sporadic accentuation of this love triangle through directorial miscues. Shots like the one of a bedside drawer full of unread letters from Tony prefer to treat Jim as a legitimate love interest, instead of what he tends to be functionally in this story – a manifestation of Eilis’s inner turmoil. Moreover he comes to represents a loss of the empowerment Eilis has found, rather than a viable alternative. The key to Brooklyn‘s success is prioritizing Hornby’s screenplay, which understands the concerns of the original story’s author. Toibin’s oeuvre has demonstrated a thematic preoccupation with the development of personal identity, particularly within the context of small-town Ireland—as in his much-heralded later novel, Nora Webster, Brooklyn’s heroine finds herself at the risk of entrapment by a bullish, catty community of people who know and involve themselves in each other’s business. And with empathetic grace, Hornby makes clear Eilis isn’t the only victim: One quietly devastating scene late in Brooklyn, finds Jim professing his desire to travel and escape the confines of the only life he’s known. In this moment he becomes not a hinderance to Eilis’ happiness, but a three-dimensional and pitiable character in his own right, existing in a way Eilis once did and representing only a possibility, one Eilis has already lived. It’s this subtle complexity—that we’re meant to feel not only joy for Eilis, returning to Tony, but also anguish for Jim and others like him—that helps Brooklyn transcend the banality of a happy ending for something murkier and more beautiful.